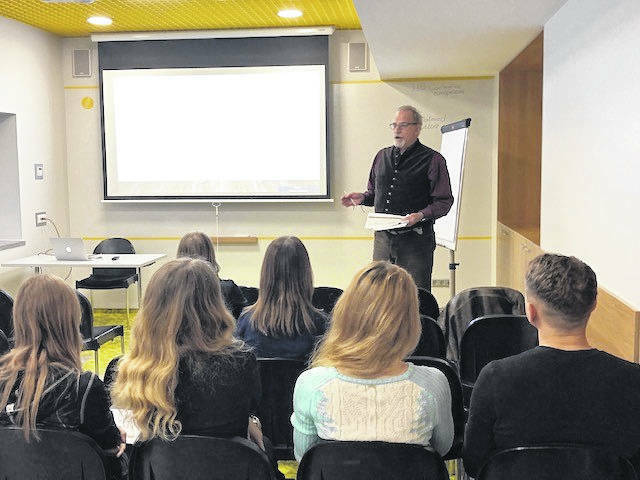 Rio Provost Dr. Richard Sax traveled to Minsk, Belarus for the 8th annual International Conference in Economics & Finance at the end of December. The conference is hosted by the Belarusian Economic Research and Outreach Center (BEROC) with Sverige, the Swedish Corporation for Developing Economies, and focuses on economics and finance, bringing together leading economists from around the world to discuss new technologies and to share research on a variety of financial topics. RIO GRANDE — To continue strengthening global relations, University of Rio Grande and Rio Grande Community College’s Provost and Vice President of Academic Affairs Dr. Richard Sax presented at the 8th annual International Conference in Economics & Finance in the Lotus Room of the Beijing Minsk Hotel in Minsk, Belarus at the end of December. The conference, which is run by the Belarusian Economic Research and Outreach Center (BEROC) with Sverige, the Swedish Corporation for Developing Economies focuses on economics and finance, bringing together leading economists from around the world to discuss new technologies and to share research on a variety of financial topics. Sax said his presentation, “International Students in the 21st Century: Opportunities for Belarus,” focused on the direct and indirect effects of international students in any given community’s economy. Sax was first introduced to BEROC this past summer through the Fulbright Scholar program when Rio hosted Fulbright Scholar Dr. Anastasiya Luzgina, deputy director at BEROC, to present her lecture, “FinTech Development and Cryptocurrency Market Regulation,” on campus. Luzgina, who is from the Republic of Belarus, gave a speech that included an in-depth look at FinTech, a new financial system format that is adaptive to information technologies and innovations, and how it works to create easier digital operations for investment banks and their clients. She also provided details about how the program has been used to improve the economy of Belarus. Sax said he is grateful Luzgina and her colleagues invited Rio to join the 2018 conference. While in Minsk, Dr. Luzgina scheduled a meeting with Sax and the Dean of Economic Faculty at Belarusian State University, Dr. Anna Koroleva, where he was able to discuss the possibility of future institutional cooperation. For more information on Rio’s international programs, contact the Office of Admissions at 740-245-7208.